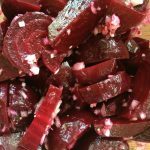 I love to buy beets at the farmers market and I have developed an easy recipe for enjoying both the beets and the greens. The best beets have their greens attached and look fresh and firm, without blemishes. As soon as you get them home rinse them in cool water, remove the stems leaving an inch intact and also leave the root ends. Immediately blanch the greens in boiling water and then drain, pressing out as much moisture as possible, chop and put in a container to enjoy later sautéed with garlic and shallot. The greens are the most nutritious part of the beet, they are loaded with calcium, iron, manganese, folic acid and vitamins A &C and they are a great source of magnesium, Iron and B6. When done remove from the oven, remove the foil and let the beets cool. They are easy to peel now and by cooking them with their skin on they retain more of their nutrients. Peel, cut in into the shape of your choice, toss with white balsamic vinegar, olive oil, diced shallots and thyme or dill, salt and pepper to taste. 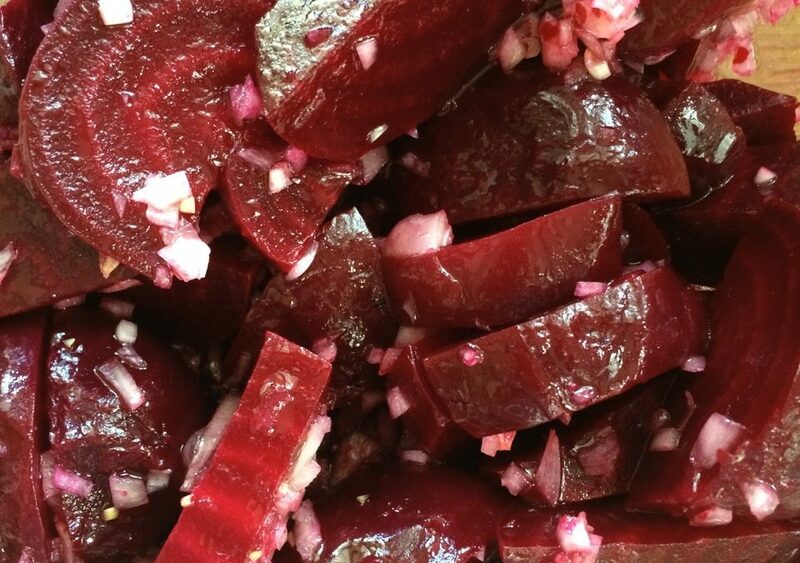 A bit of orange or lemon zest and a squirt of the juice adds nicely to marinated beets. Want to learn why beets are such great fuel for your body? Here are 5 reasons.